While most times, the danger of partaking of the communion unworthily is emphasized and Christians are urged to examine themselves before communion to avoid what the verse talks about which is sickness, weakness and death, can we take a moment to go back to that scripture and see what is written there that is not literal? Are you therefore faced with weakness, pain or sickness? Then you need to take communion and declare the word. 2. Why do we break the bread? Isaiah 53:5 “But He was wounded for our transgressions, He was bruised for our iniquities; the chastisement of our peace was upon Him, and by His stripes (wounds), we are healed." Sickness was done away with by virtue of the full price He paid for our healing on His body. The bruised, battered, and wounds ensured our total victory over sickness and disease. Therefore, whenever we break bread, we show forth the Lord’s death. We remember His body broken for us and it is therefore an assurance that since His body can never be broken again, my body can never be broken ever. The breaking of Jesus body through the stripes He bore on our behalf was not for the redemption for the soul of Man. In the reign of the Roman era, a man is either scourged or crucified. If Jesus was crucified, the salvation of our soul would have been accomplished. So what was the essence of Him going through the ordeal of being whipped and then dying on the cross? The above verse in Isaiah summarizes it. His battered, bruised, bloody body was for the accomplishment of the healing of our bodies. That is why we break the bread during communion. From this passage, it is clear to all and sundry that after Moses complied with God’s instruction, anyone who further died of the serpent’s bite are those who refused to look up. For the word was that “everyone who is bitten who decides to look up shall live." Whether old, young, tall, short, fair, dark, fat, slim or whatever category can live if he or she decides to look up. The bible further makes us understand that the bronze serpent was a typology of the cross and Jesus hanging on it, paying the full penalty for sickness, sin, pain, oppression, poverty and every form of negativity. Therefore, anyone who looks at the cross today will live. And in the context of healing, anyone who is down with sickness and looks at the cross is assured of living. 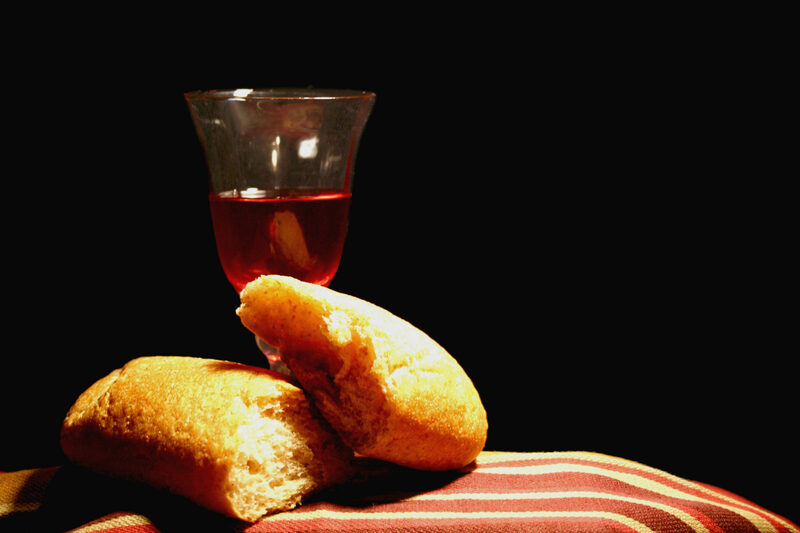 Communion can therefore be likened to “looking up “because when we break bread, we are remembering the Lord’s death, we are seeing Him on the cross and remembering all what he accomplished on our behalf and furthermore announcing to the devil and his cohorts that Jesus had paid the price. Dare to live, dare to “look at the cross today”. 4. Luke 24:30-31 “Now it happened as He sat at the table with them, that He took bread and broke it, and gave it to them. Then their eyes were open and they knew Him…." This is a familiar story of the two men on the way to Emmaus. They journeyed with Jesus, spoke with Him but could not discern Him because the eyes of their understanding was darkened. It took Jesus breaking bread for them to be able to know Him. When we break bread and partake of the communion, our eyes are opened to spiritual truths and depths in the Word. Remember that Jesus is the Word and the Word was present with them physically yet they did not know. Not to talk about this time that we don’t have Him physically present with us. Do you have kids that you feel are dull and lack understanding, break bread in your house and command their brains and intelligence to work to the highest capacity ever. A man’s health life is gauged and measured by the type and kind of blood he has. What is the first question you ask a person who is frequently ill, pale, weak and crisis prone? You ask, “are you a sickler?” or you hear doctors say stuff like this “those with O blood group are prone to having so and so medical conditions” etc. The Israelites were asked not to eat blood because God made them understand that the life of the flesh is in the blood. The implication being that if they eat blood, it is as good as eating the life of whichever animal or people blood that was eaten. Every time we partake of the communion wine which symbolizes the blood of Jesus, we are partaking of the life that He has in Him. We are saying that we have the life (blood) of Jesus in our veins and that life (blood) determines how our life is. This is a life superior to pain, sickness and all the wiles of the enemy. That is why the bible in Ephesians 5:20 states that “we are members of His body, His flesh and His bone and in 1 Corinthians 6: 17 thus “He that is joined to the Lord is one spirit with Him”. “For as the body is one and has many members, but all the members of that one body, being many, are one body, so also is Christ. For by one Spirit we were baptised into one body whether Jews or Greeks whether slaves or free and have all been made to drink into one Spirit." Ever wondered why members of secret societies drink blood? And why this is usually the last form of initiation which makes a person a full fledged member of that cult? It is because the blood signifies that the life and essence of the cult resides in the being of that person. The blood signifies a seal of that membership. I pray your faith in the power of Communion will increase in Jesus name. Photo credit: jennymountchurch.co.uk, www.jesus-story.net and churchbytheriver.org.uk. The message on the holy communion is a message sent to the family of God to confirm her portion in Christ. understanding of my being a member of Christ body is stemmed from the understanding that i am a child of God, that he is Lord over my lives and that is mission to earth was for my own sake and by his blood i have now become whole physically, mentally, spiritually and any other dimension of wholesomeness. it confirms the power vested in the blood line of Christ which now has become my life because i am in Christ and my life is hid in Christ. i opine here that communion and its benefit are for BELIEVERS, BONAFIDE CHILDREN OF GOD. as true as it is that i need partake of his body and his blood as often the condition precedent from an understanding of scriptures is that i am saved and that i am a Child of God. there other means for my healing if i am not saved or if i am not come to the understanding of what it is to accept Christ as my Lord and personal saviour. scriptures say the prayer of faith will heal the sick, there is the prayer of agreement concerning a man's situation that can bring about healing following which when the person is of age he can be shown the way of Salvation. As a Christian, Can I Collaborate In Sin? Do You Know What's on the Inside?